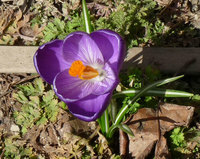 This second week of March has been an active time of transition into Spring. On Monday, the silver maple tree (Acer saccharinum)at the bottom of my field opened its flowers. On Tuesday, the red maple (Acer rubrum) by my house did the same. Flocks of robins (Turdus migratorius) are arriving every day, and they are feasting on the earthworms that are rising up out of the thawing soil. On Friday a group of eastern bluebirds (Sialia sialis) joined the robins at the edge of the receding snow pack out in my field to join in the earthworm feast. 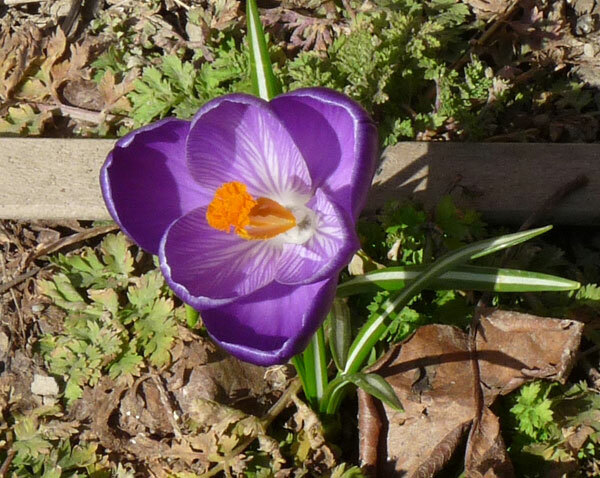 The crocuses have started blooming. The first ones opened in the flowerbed on the south side of my house, and, as the week went on, they were joined by a riot of colorful blooms progressively further and further away from the heat radiating bricks of the house. Deborah and Kozmo and I had tried to go for a hike down on Roaring Run on Monday but were turned back after a few hundred yards by the uneven, snow covered trail. 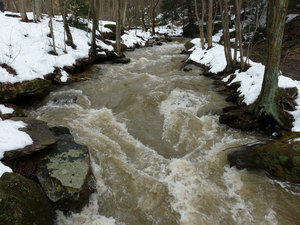 On Friday, we decided to go and try the back end of Roaring Run, the Rock Furnace Trail. The parking area off Brownstown Road near Apollo was empty but looked dry enough to be negotiable in our Subaru. The southeastern exposure of this section of the trail had led to almost complete melting of the snow. Down in the ravine of Roaring Run creek, though, and all across the opposite, northern facing slopes, the snow cover was still thick and nearly continuous. The creek was living up to its name: as we followed the trail down into ravine, we had to shout to each other in order to be heard. It was like standing near one of the mountain streams coming off of the Rockies in Colorado, or being on a subway platform when a train comes in. The sound filled up all of the space around us. We had been watching all of the snow melting for the past two weeks. Now we had a visceral impression of where all of the melt was going and of the power the melt water carried as it flowed. I was glad that we had a house up on the top of a hill. In less than a quarter of a mile we arrived at the McInerney #6 gas well. Across from the well is a concave cut into the high, shale hillside. This rocky concavity faces due south and acts as a very efficient solar collector. This is the spot where we see the first spring flowers and the first green leaves on several types of shrubs and trees. There is a small wetland here, too, that in rainy spring seasons stays full of water through mid-June. In those years the water fills with frog tadpoles and immature salamanders (and also garter snakes looking for a quick meal!). It looked like this year was going to be a good one for amphibians, but it’s far too early to see any of those. Halfway up the crumbling hillside, though, we found what we were looking for: the small, bright yellow flowers of colt’s foot. 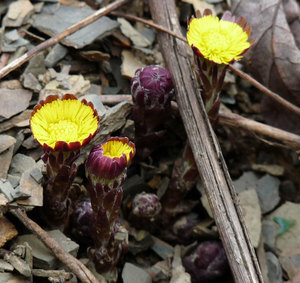 Colt’s foot (Tussilago farfara) is one of the first flowers of spring. It is a very common plant of roadsides, ditches, fence rows, and disturbed land. It is not a native species of North America but instead was introduced by European settlers possibly by accident or possibly intentionally (the plant has a number of medicinal applications and uses).This perennial plant throws up its yellow, dandelion-like bloom long before any shoots of leaves are formed. The flowers are pollinated by a variety of early insects (especially bees) and seeds are formed before the broad, flat, “hoof-shaped” leaves begin to emerge. Also, thriving in the warm micro-environment of this hillside were legions of small, black spiders of the genus Pardosa. Each step up the hillside sent dozens of them scurrying away through the leaf litter. It would be a couple of weeks before they emerged in the field near out house. The collected solar energy here was driving the season rapidly toward April! Along the trail were several black cherry trees (Prunus serotina)that had been hammered and chiseled by one of my favorite birds, the pileated woodpecker (Dryocopus pileatus). We had seen one of these wonderful woodpeckers flying from tree to tree along our short Monday attempt at a hike. Now the pileated is not a sign of spring. It is a year-round resident of Western Pennsylvania. 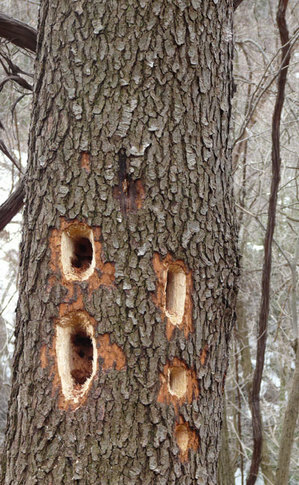 A mating pair typically has a territory well staked out that includes an abundance of ant-infested trees into which they seemingly effortlessly carve rectangular shaped feeding holes. All though this forest we have seen these characteristic holes dug almost exclusively into black cherry trees. One of the trees today had piles of fresh wood chips all around it. Their nest holes would be high in one of the larger trees typically along one of the creeks or streams. Sycamores seem to be one of their highly favored nest trees although last year we spotted a pileated nest near here up in a tall white ash. We would keep our eyes open over the coming months for their nest site. Along the trail a number of plants were emerging green and leafy from under the melting snow. Garlic mustard, unfortunately, was the most numerous of these snow-tolerant, early spring emerging species. The brown, leaf covered hillsides were also highlighted by scattered clumps of over-wintering green ferns. Christmas fern and evergreen wood fern grew widely across the open forest floor, and the common polypody fern was thick upon the dripping, moss-covered rocks. Seedlings of the American beech are very abundant down in the ravine. Most still had last year’s leaves clinging to their branches. The leaves were dry and pale in color and were rolled up into tubes that rattled in the passing breezes. Beech seedlings are one of the few young trees that white-tailed deer refuse to eat. We expect, then, in these incredibly deer-impacted forests, to see more and more American beeches filling in the vacated niches of the other, more deer-palatable tree species. The forest floor all down into the ravine was covered with a thick, heterogeneous layer of wet, brown leaves. They had been pressed flat against the underlying soil by the snow cover and were now shining and oozing with the flow of the melt water. All across these great, wet flats of leaves were curving, interconnecting trails cut by voles and other rodents as they ran about in the sheltered space beneath the snow. This subnivian space provided these small rodents both protections from the elements and also from predators like hawks and foxes. The melting of the snow makes the climate less stressful but adds more danger to the surface movements of these active animals. We did three miles on mostly open trails. We did some trail maintenance by pulling some leaf dams out of drainage ditches and re-routing water flow that was eroding the trail surface. I had brought my binoculars but saw no birds out in the windy, drizzly afternoon. There will be a phoebe along this trail soon, and he will follow us on our hikes to make sure that we leave his territory. There will also be male scarlet tanagers arriving very soon to stake out their nesting territories, but they keep their distance from passing humans. Spring is so close! You can’t help but feel it! My husband and I often walk the Rock Furnace Trail. A lot less people traffic than Roaring Run and the up-and-down is better for the exercise routine. It was absolutely gorgeous in the winter snow, but we are quite ready for the easier walking of the spring! I am a big fan of pileated (and downy) woodpeckers (who seem to love the numerous cherry trees on my property), but I was not aware that there were tanagers in this area. Thanks for giving me more to look for and appreciate when I’m on the trail! I too love colt’s foot! what a great name for this early spring bloom. Well, the snow is still melting here in Belknap. It has disappeared to only a few inches now! I am sure there are signs of spring under there somewhere! We are starting to see patches of green/brown. We will have to wait another day or so. We did have a sure sign of spring. We had our first spring calf this week and another one soon to be delivered. I guess that will depend on the stork! We are glad that the rain has seemed to pass so that the calf can be born on a warm, sunny day! The horses and cows are starting to rub there coats. The white horse seems to especially be shedding. No outfit is complete without a few horse hairs.